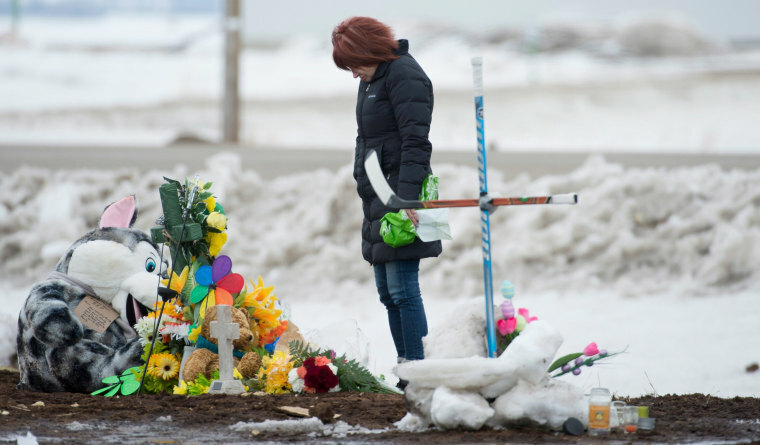 Mourners experienced a fresh wave of anguish after one of the dead Humboldt Broncos players was mixed up with a survivor of the crash that killed 15. HUMBOLDT, Saskatchewan — Families and friends already stunned by the deaths of 15 players and team personnel for Humboldt’s youth hockey club got a new shock Monday when authorities announced that one of the dead had been misidentified. The Ministry of Justice for Saskatchewan Province said the mistake occurred partly because all the Broncos players had dyed their hair blond for the team’s appearance in the playoffs and because all the young men had similar builds. Drew Wilby, spokesman for the ministry, and the Office of the Chief Coroner apologized. He said families had been involved in identifying the remains of the crash victims at a makeshift morgue and the error wasn’t discovered until Sunday night. Meanwhile, Xavier Labelle’s family had confirmed his death, with his brother Isaac writing in an Instagram post that he was heartbroken.